If you are trying to eat healthier by cutting out fat, then an air fryer is a great appliance to keep in your kitchen. It is similar to a deep fryer because it cooks food from all sides at once. However, it uses rapid air technology to do this instead of oil, making it a much healthier alternative to deep frying foods. The HLK58-004 fryer by Homeleader is one option on the market. With a moderate price of $130, it seems to be a good option. How does it stack up against the rest of the air fryers out there? Keep reading this air fryer review to find out. Overall, this deep fryer has a solid design. It seems sturdy and well put-together. It also does not have an excessively large exterior and a small interior, like many of the other options out there. Another bonus is that this comes with a 3-quart basket, which is larger than a regular sized air fryer. It could probably prepare appetizers for 5-6 people or a meal for a small family of 4. There is one major design flaw of this oil-less air fryer. To open the fryer drawer, you have to press a button on the handle. This button is located close to the machine and is difficult to push. This is made worse by being close to the fry drawer, because it can get very hot. It may even burn you if you are not careful. One of the great things about this air fryer is how easy it is to clean. Most manufacturers sell their air fryers as being dishwasher safe and fail to deliver. This Homeleader air fryer, however, says dishwasher safe and delivers. It can be washed in the dishwasher over and over again without the non-stick coating scratching or chipping off. 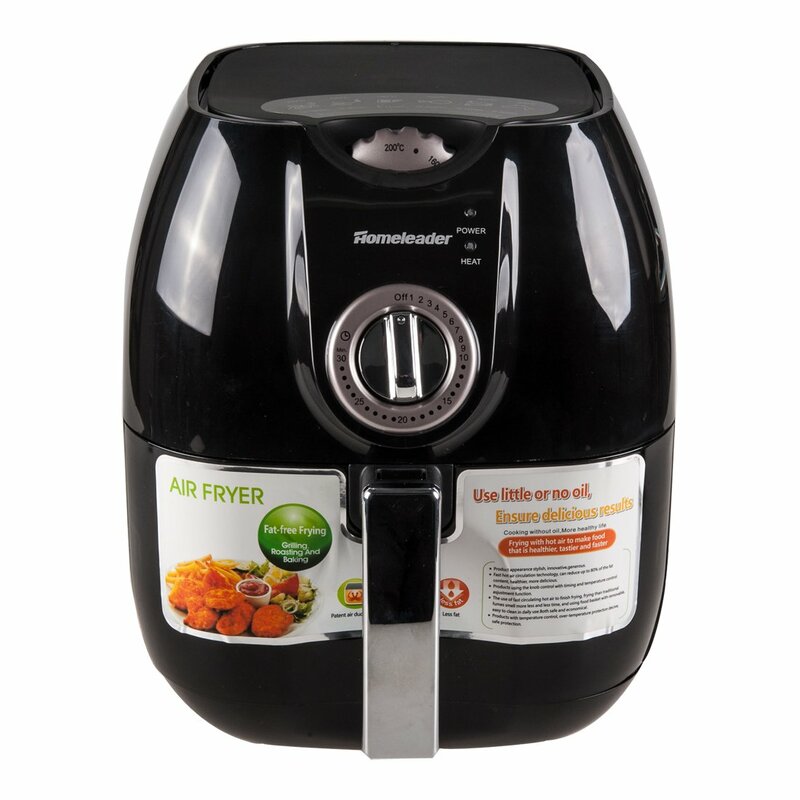 There are a few things to consider in regards to how easy the Homeleader HLK58-004 Oil-less Air Fryer is to use. First, the fryer comes with a thirty minute timer with an automatic shut off. Both the timer and the temperature are manual, meaning you have to turn a knob to operate them. The first thing that you should know is that the thermometer is in Celsius, not Fahrenheit. This is good for people who can work with Celsius, but it is even sold with Celsius on the dial in the United States. The other thing to consider is the manual. The instruction manual leaves quite a bit to be desired. It is informative, however, it is filled with spelling and grammar errors, almost as if it was poorly translated from another language. This air fryer has a wide range of uses, including roasting, grilling, bbq-ing, and broiling, as well as frying. For this review, we will be considering how well the air fryer “fries” foods. The first thing that you will notice is the smell coming from the air fryer. For the first couple of uses, the fryer may emit a slight “plastic-y” odor. This will go away after the first few uses, though. Think of it as a breaking in period. The other thing to consider is the taste of the food. Of the different air fryers on the market, this one comes closer to producing a real deep fried flavor than most of the others. It takes a little bit longer to cook, but foods come out incredibly crispy and moist. It also makes excellent pre-cooked frozen foods, such as jalapeno poppers, tater tots, and egg rolls. For $130, this is an excellent air fryer. It does not have the conveniences of some other air fryers, such as touch screen interface or digital timers and temperature reading. However, it makes up for this by producing incredibly well flavored foods. Even with the flaw designs and slight difficulties when it comes to using the fryer, this air fryer overcomes it by producing an incredible meal. It also has a slightly bigger capacity than other average sized air fryers. Overall, this is an excellent choice if you want to enjoy fast dinners and incredible fried taste, especially if you do not want to monitor what you are cooking.